Maximize bedroom storage in order to minimize clutter and stress. Bedrooms are meant to be relaxing places, yet they also serve a number of practical purposes: dressing, grooming, and sleeping being chief among them. In addition, these personal retreats are expected to house a lot of stuff – important stuff, stuff we access every day. It can sometimes be tricky to combine the look you long for with the storage you need. 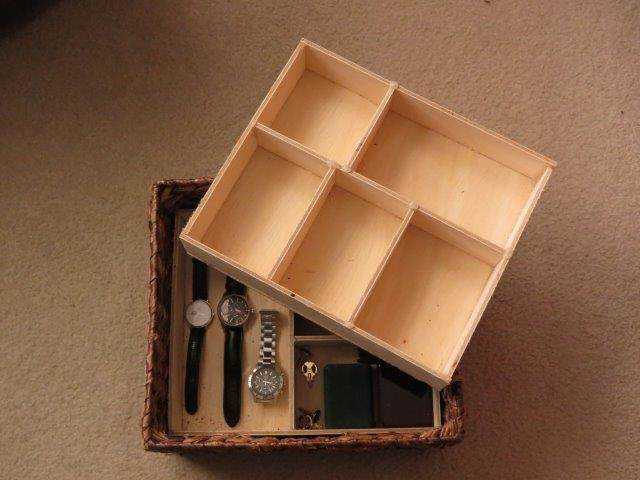 The key is to look for attractive, functional storage solutions. A variety of options are available. The more different options you are able to utilize, the more efficient and comfortable your room will be. If closet space is limited, consider a chifforobe or armoire, both of which are designed to hold both hanging and folded clothes. Another option is a free-standing hanging rack, but these are rarely attractive and are often awkward and flimsy and are, therefore, not recommended. If your bedroom has the space and the need for a desk, choose a desk with drawers in order to keep desk clutter to a minimum. The dressers with built-in bookcases pictured above offer versatile bedroom storage, particularly in a child's room. Combining multiple dressers provides storage not only for clothing but for other items such as bedding, toys, games, and personal treasures. You can add additional bedroom storage by searching for a bedside table with drawers, shelves, or a combination of the two. If space permits, you might even consider placing small, low dressers on either side of the bed to maximize the room’s storage potential. ​Traditional nightstands are only one of the many options available for bedside storage. Look for something with maximum storage capacity like the basket table shown below. You can further increase storage by lining drawers with dividers. Layer wall shelves one on top of another for maximum impact and storage. Extend wall shelves around the perimeter of the room at a certain height. Try lining the walls with bead board or wainscoting to a height of about 5’ and topping the paneling with a shelf. Top a window with a shelf instead of a valance. Hang a shelf beside the bed at bed height for an inexpensive alternative to a bedside table. Hang wooden cubes or crates to serve as storage or display cubbies. Tilt a tall, narrow bookcase on its side and attach it horizontally to a wall for a maximum capacity storage solution. Hang decorative hooks or hook racks for storing handbags, hats, clothing, jewelry, or baskets for stashing odds and ends. 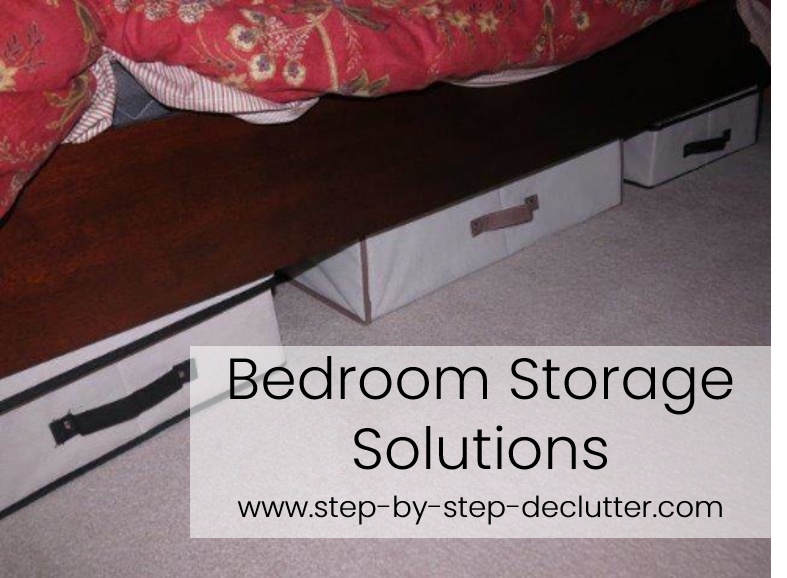 The space beneath the bed is a great place to hide bedroom storage. Stash extra bedding, out of season clothing, exercise equipment, luggage, and anything else that needs an out-of-the-way yet easy to access home. A variety of under bed storage solutions are available for purchase. Options with wheels are particularly desirable for sliding in and out with ease. If your bed is too low to the floor to accommodate under bed storage, you can always purchase inexpensive risers to give you access to that prime storage space. Note: Personally, I'm not a big fan of canvas or vinyl options because in my experience they don't hold their shape very well. 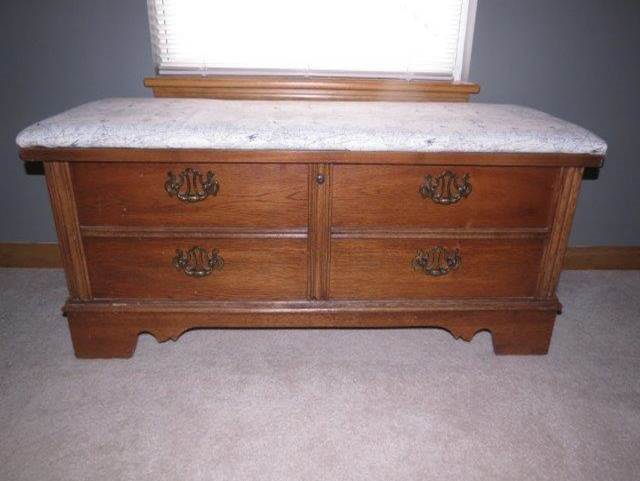 Another option is to make your own under bed storage by attaching casters to a simple wooden box or old dresser drawer. The plus of the dresser drawer is that it already has a handle, making it easy to grab! Do you know someone who would benefit from this information? If so, please share this page on social media. Then leave me a comment in the section below so I can thank you personally.